The village sits just to the south of Billericay, the church some way south of it, remote, locked, and not taking part in the Historic Churches Bike Ride. No sign up on the main road to tell you this - thanks guys, I hope you won't mind if someone puts in an objection if you ever apply for a grant from the Essex Historic Churches Trust. 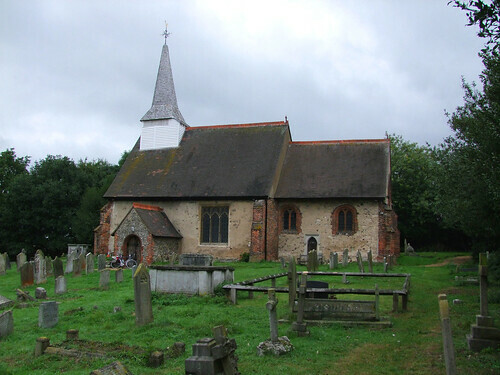 A typical small Essex church, a quarter of a mile or so from the nearest lane, wooden bell tower. The view below is of the vast Thames Valley industrial complex - you could just make out the Dartford crossing. A disgracefully neglected little church, as if it has already been abandoned. Very sad. I headed on through reassuringly remote lanes to Heronsgate and then down the Thurrock road to East Horndon.